We all know how important eating breakfast is, as it can help kickstart our day with nutrients that give us energy. Although it's definitely important you eat a meal in the morning, there are certain foods you should avoid at breakfast, as they can end up sabotaging your day later on. It can be tempting to grab something quick from the vending machine or get some fast food on your way to work, but these foods can have detrimental health effects that extend beyond just lunch. What you eat first thing in the a.m. can have an impact on how well you focus and how hungry you are in the afternoon, but it can also have long-term effects that affect your chances of getting diabetes or heart disease. When it comes to breakfast, it's best to load up on whole foods that are filled with protein and complex carbohydrates. "Breakfast sets the tone for the rest of the day," says chef and nutritionist Brigitte Theriault over email. "The sooner you can get something healthy into your body, especially protein, the faster your blood sugar levels stabilize. This helps improve your mood, energy levels, and keep you full longer. If you're looking to begin your healthy habits as soon as you wake up, consider avoiding these seven foods at breakfast that although may be tasty, can leave you feeling sluggish and fatigued later on. 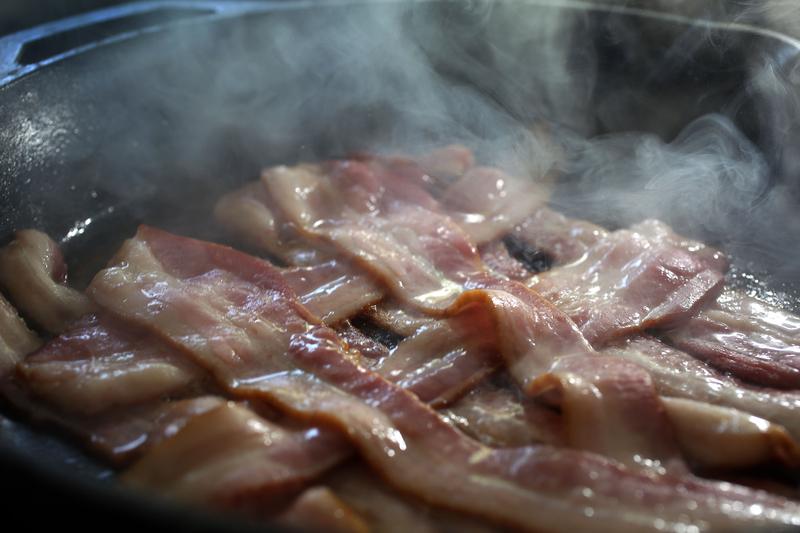 Bacon is high in fat, which requires extra work for your body to digest. Research from the International Journal of Food Sciences and Nutrition found that people who ate high-fat breakfasts in the morning were less alert during the day than people who ate a breakfast high in complex carbohydrates. They also ended up hungrier later on than their complex carbohydrate-eating counterparts. "Pancakes are white flour and sugar," says Theriault. "There is zero nutrition in a pancake, except for the egg, and the the breakfast combo of white flour and sugar will spike your blood sugar levels, causing a drop in energy several hours later. This will have you reaching for more sugar and carbs for lunch." "Fruit juice, especially from concentrate, isn't ideal for breakfast," says Theriault. "One cup of orange juice has 21 grams of sugar, and one cup of apple juice has 24 grams of sugar and no fiber or protein." If you're trying to load up on nutrients in the morning, you're better off eating whole fruit or opting for a small glass of something freshly squeezed. Although it's OK to accompany your breakfast with a cup of coffee, make sure you're sticking to the right types. "Too much caffeine will send your body on a rollercoaster," says Tiffany Newenhouse, RD over email. "Stick with one cup of good quality coffee, and add cinnamon or pure vanilla for flavor. Skip the whipped cream, chocolate, and caramel syrup." Many of us ate cereal as kids, but most varieties are far from a healthy breakfast option. "Artificial flavors, artificial colors, excessive sugar, no protein or fiber, need I go on?" says Newenhouse. Despite their health claims, breakfast cereals contain more sugar than experts recommend, with many as sweet as cookies, according to the Environmental Working Group. "The combination of simple carbohydrates and butter or cream cheese does nothing to sustain energy levels during the day," says Newenhouse. "Lacking protein and fiber, bagels can send your sugar levels sky high. One bagel can be equal to four slices of bread in terms of carbohydrates." Although granola may be packaged under the guise of being a health food, it's actually more like a dessert. "Granola is loaded with extra sugar," says Newenhouse. "A serving is usually 1/4 cup, and I assure you if you measured that out you are eating more than that." Choose to make your own granola, or stick to plain oats and nuts and lightly drizzle with honey instead. When it comes to breakfast, staying away from sugar is extremely important. "Eat eggs, nuts, lean meats, vegetables, last night's leftover dinner, or a smoothie that has protein inside,"says Theriault. "The goal is to stabilize your blood sugar levels with protein so that you'll curb cravings and have energy throughout the day."